Panasonic's LQ70 Series of 4K UHD LCD displays employ 4K picture quality to render intricately detailed, large-screen images. They literally fill the screen with dynamic, large-scale pictures. 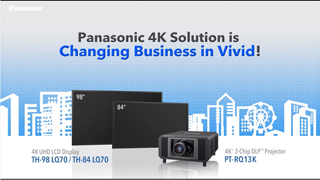 And unique video technologies accumulated from Panasonic's development of projectors and broadcast monitors deliver images with high precision and faithful color reproduction. The LQ70 Series has protective grass with 3.5J* impact resistance on the front of the display. With its strong resistance to external impacts, this rugged design allow s safe installation in places where many people walk by, such as train stations, airports, and shopping malls. The special frame construction also resists twisting to boost reliability during installation. Ideal for rental applications, where the panel is frequently transported and installed. * This value is from a Panasonic test. It does not imply a guaranteed value. When the LQ70 Series is installed vertically, it can display a person in almost life-size dimensions. 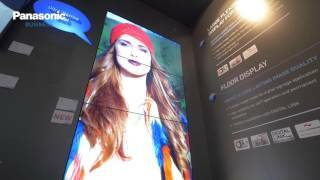 It is also ideal for digital signage use because it faithfully reproduces the textures and colors of a model's clothing and accessories. It helps to maintain a high-quality brand image. Vertical installation also has no effect on the lifetime of the panel. The LQ70 Series' high-resolution images clearly show even the fine textures of objects. When placed near the entrance of a store, the display will effectively catch the attention of people walking by. * In case of long time, the moving image is recommended to be displayed. If you display a still picture for an extended period, the image retention might remain on the screen. However, image retention can gradually disappear by displaying a moving images. * A comfortable viewing distance varies depending on the type of image, the viewing environment, and the physical condition of the viewer. Panasonic's new-generation image processing technology (Detail Clarity Processor3*) also reproduces non-4K image content, such as Full-HD images and PC signals, with high picture quality. In addition, it compensates motion images for smooth, non-blurry display, which was difficult with conventional models. * Optimize the frequency and level of the input signal in horizontal and vertical directions to produce beautifully sharp, clear images. The LQ70 Series includes interfaces for 4K60p video input as standard equipment. In addition to HDMI video input, it is equipped with DisplayPort that support 4K60p video. This enables input from a variety of 4K devices. SDI connection is also possible using an optional 3G-SDI terminal board. The color space on LCD displays tends to narrow when the luminance level drops, and it's often accompanied by color phase shifts. 3D-LUT (Look Up Table) Color Correction on the LQ70 Series has a look up table for each luminance level. Six Axis Coordinate Correction applies image processing to balance the six axes of the three primary colors (RGB) and their complementary colors (CMY). This keeps the intermediate shades of extremely fine colors vibrant and lifelike. 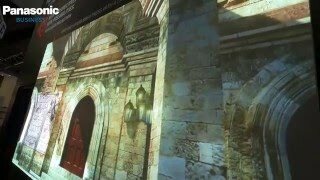 * Images on screen are simulated. 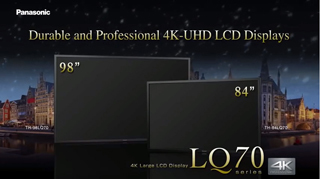 The LQ70L Series is 23% lighter than the LQ70 Series (for the 98-inch model). By mounting eyebolts to the installation holes of the LQ70L Series and attaching hooks to the eyebolts, the unit can be easily moved and installed using a hoisting device such as a crane. The tough frame resists twisting and distortion, thus reducing the burden on the installation staff. * The unit must be installed or uninstalled only by a specially trained. The size and positions of mounting holes on the LQ70 Series are the same as those on a large Panasonic plasma display (103-inch/85-incy model). This enables the use of existing peripheral accessories. When replacing a Panasonic plasma display with the LQ70 Series, the existing mounting fixtures can be used, thus reducing the labor and cost of replacement. The LQ70 Series features a 4-Input Multi Display function. The image can be switched from a full-screen display to a 4-Input Multi Display with a single press of a remote control button. Ideal for checking details in various applications, such as videoconferences, digital signage, and surveillance monitoring. * Some restrictions exist for input signals and display splitting. * 3G-SDI input and 4K image are not supported by the 4-Input Multi Display function. with one press of the MULTI DISPLAY key on the remote control. A new SLOT NX makes it possible to change the interface to match the application. If the optional 3G-SDI Terminal Board is mounted, the LQ70 Series can be connected with SDI. This feature is convenient for use in broadcasting stations, for rental use and for long-distance connection. The LQ70 Series is expandable and will accommodate 4K input in the future. * All images shown are simulated. * SLOT NX is not compatible with SLOT 2.0. The high-resolution screen is ideal for fine text in airport flight displays and train schedules. The rugged design also provides excellent durability. Product details and textures are very true-to-life. The outstanding expression of the large 4K display effectively captures attention. Superb durability and easy installation allow for safe and secure use in events. High-quality images and the large-screen presence raise the level of excitement. Real-time presentation is also achieved by suppressing the delay time from input to display. The high resolution and large screen size make previously difficult-to-see images sharp and clear. It's ideal for monitoring, because even slight movements can be easily detected. It's also fully capable of 24/7 operation. The beautiful 4K large screen provides sharp real-life images. Color temperature can be set from 3000K to 11500K. And an optional terminal board enables SDI connection, ideal for broadcast station or studio use. The large-screen display provides clear visibility even for meetings with a lot of people attending, and high-definition images are ideal for design and simulation use. The 20W (10 W + 10 W) speakers are built into the rear of the display. There is no need for external speakers when using content that has a soundtrack. * For higher volume sound, use an external audio output and more powerful speakers. This function controls the LED backlight intensity of particular parts of the displayed image. This significantly increases the contrast ration of a certain area of the screen image. The screen saver reduces the afterimages that can occur when continuously displaying still images or 4:3 images for long periods of time. The backlight brightness is automatically adjusted according the viewing environment. Can reduce power consumption. * [Sensor] of [Power Save] mode is ON. Optional ET-SWA100 Early Warning Software lets you check the status of system equipment with a tablet of PC located at a distance from the monitoring server. This helps to quickly solve any problems that might occur.